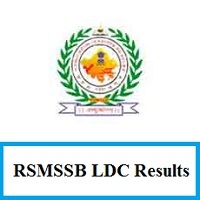 RSMSSB LDC Results 2019 With Marks is Available Now: The officials of the Rajasthan Subordinate and Ministerial Services Selection Board (RSMSSB) has released the RSMSSB LDC Results for the held RSMSSB LDC Clerk (Gr-II) Exam. Now, the aspirants can download their Results from 7th March 2019 on the Official website of Rajasthan Subordinate and Ministerial Services Selection Board. So, all the appeared candidates for the test need to check out the result online only at the official website @ rsmssb.rajasthan.gov.in. Furthermore, the Higher Authorities of the Rajasthan Subordinate and Ministerial Services Selection Board (RSMSSB) before declared that the candidates need to wait till 15th March, but, they declared the Results on 7th March only. Those are the Results for the EXamination held on 12th August 2018 to 16th September 2018. Moreover, the upcoming sections will illustrate you with the RSMSSB LDC Cut Off Marks and the RSMSSB LDC Merit List. Also, you can get the direct link and steps to download the rsmssb.rajasthan.gov.in Result. 1.4 How To Check RSMSSB LDC Results 2019? We heard that many of you have applied and attempted the RSMSSB LDC Gr-II Exam. And those who are waiting to check out the RSMSSB LDC Exam Results 2019 from the Official website of RSMSSB. As of now, the officials of the Rajasthan Subordinate and Ministerial Services Selection Board (RSMSSB) released the Merit List and the Cut Off Marks for the candidates who had selected in the Examination. Moreover, the direct download links for the Results are given at the end of the page. Also, step by step procedure to download from the Official website @ rsmssb.rajasthan.gov.in is mentioned in the below sections. It is very important for all the candidates who have given a part in the examination. Because by checking the RSMSSB LDC Results 2019, you can know your status of the selection process. Also, the selection of aspirants will be done on the basis of merit. The selection of applicants will be based on written test and interview rounds. Candidates qualified in all the rounds of the selection process with good merit will be finally engaged for the jobs. Candidates have to clear the test with almost the below given RSMSSB LDC Cut Off Marks. So, those who score the minimum cut off marks will only have the chance to enter to the further levels in the selection process. And these RSMSSB Cut Off Marks varies on different factors. So, have a look at the below table to know the marks as per the Date Of Birth of the participants. Well, the officials of the Rajasthan Subordinate and Ministerial Services Selection Board (RSMSSB) released the RSMSSB LDC Merit List 2019 on their official portal @ rsmssb.rajasthan.gov.in. So, while checking your RSMSSB LDC Results 2019, you can easily find out the RSMSSB Merit List. By using the keywords like the Hall Ticket number or the candidate name, one can find out whether they have placed in the merit list or not. Candidates who score the highest marks will only be placed in the Merit List. Later on, the officials of the RSMSSB will update the Toppers list on their official portal. How To Check RSMSSB LDC Results 2019? We heard that many of the candidates are facing issues while checking out the RSMSSB LDC Results 2019. So, for such sake, we here gathered a path to find out the RSMSSB LDC Exam Results 2019 without any issues. At first, candidates log in to the official site of Rajasthan Subordinate and Ministerial Services Selection Board (RSMSSB) @ rsmssb.rajasthan.gov.in. The home page of the RSMSSB will appear on the screen. Candidates need to scroll down the page and then click on the “Results” section. Then, all the eligible candidates need to find out the link over the listed links. Furthermore, click on the link that refers to the desired position. In that new window, enter your Hall Ticket Number, Date of Birth details and tap on submit button. Soon after your submission, you can find your RSMSSB LDC Results 2019. Also, take out the printed copy of it for further usage. Candidates can get the exact date for the RSMSSB LDC Results 2019 only when they stay in touch on Freshers Now page. And you can even bookmark us by Ctrl + D for the more alerts.